A Great Family Holiday Park Our team will make your holiday one to remember! Jazz preparing a little guest for our flying fox experience! We have a great team committed to providing our guests the best possible holiday experience. The owners, Melanie and Russell Diffey have created a wonderful team who always work together to provide guests with the best possible holiday experience. We proactively listen to guest feedback and always strive to do things better. 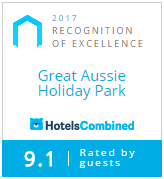 Guests who have stayed at our park often comment on how friendly our holiday park team is and how hard they work to give our guests a relaxing and fun holiday. Our team is easy to find, with our brightly coloured uniform and we are always out and about around Great Aussie Holiday Park so be sure to say hello when you walk by.